Blending the vocal dreaminess of Eddi Reader with the self-conscious wobble of Feist, Feathers is an album free of baggage tying it to any genre. It can't justifiably be pinned down as Folk (despite the banjos) or Americana (refreshingly, her accent is all her own) this is simply emotional, acoustic music. The best songwriters often say their songs pour from the heart and sometimes emerge fully formed, unbound by commercial concerns or stylistic box-ticking and this certainly seems to be the case with Gitta De Ridder. 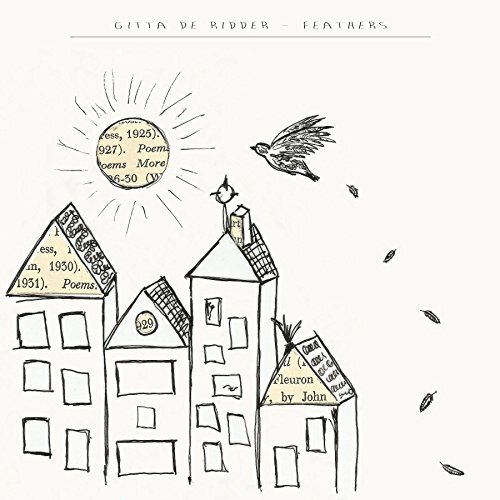 Recording Feathers at home in London, De Ridder started with live takes of guitar and voice and then stacked up layers of backing vocals, bass and hand percussion. It's a method not uncommon with acoustic singer-songwriters who shudder at the idea of working within a traditional band setup. Working in this organic and largely drumless soundworld, she's created a record full of homespun charm and there's a palpable lightness to the whole thing, making the title very apt. While the result of the recording approach is an album that feels small and fragile, Feathers is nonetheless rich and very nicely detailed. From the playful toy glockenspiel and handclaps of current single 'Even If', through the chunking mandolin of 'We Make Three' to the weeping cello of 'Till The Day That I Die' you feel each song evolving; moving from its guitar-centred beginnings into new sonic territory. Gitta De Ridder walks exactly the right line between keeping things varied and staying true to the needs of the songs; so nothing on the record feels overworked. Indeed, many of the more intimate songs (‘Feathers’ and ‘Lie With Me’) are pleasingly bare and raw sounding, as if they were written then recorded straight away. It’s this freshness that makes Feathers so appealing and - with a voice like De Ridder’s - so very beguiling. Elsewhere on the album there are echoes of early Jewel in the confessional tone of 'Stay a Little Longer' and the hushed intimacy of Lisa Hannigan in the gentle rolling banjo of the exquisite 'Victory', a personal favourite. The quietly sad ‘Oh Tommy’ and album closer ‘Lie With Me’ showcase De Ridder’s deft and delicate fingerpicking, reminding us that songs as personal as this are so often most effective left to just voice and guitar. The emotion in the vocal delivery is something completely unfakeable, and that’s one of the best things about Feathers: it feels genuine in a way that so many other records don’t.